Continuing from the last blog post I'm still working with graphite, this time for the Nature Sketchbook Exchange Project. It seems appropriate to do a bit more than just drawing a picture because it's a sketchbook project, so over the last couple of days I've been experimenting with a few different pencils brands. 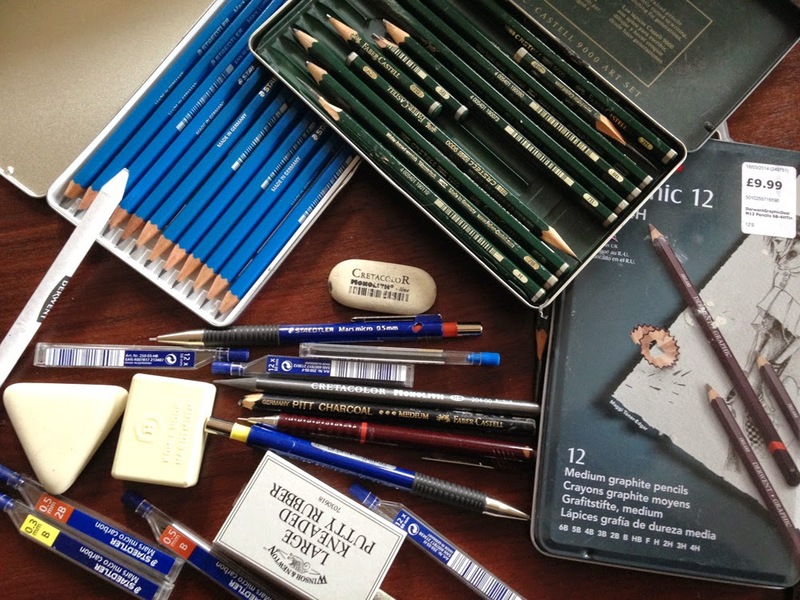 There are a number of pencil to choose from, all of which are suitable for botanical work, I tend to stick with the same pencils but having tried out quite a few over the years I've accumulated some unused ones. I try to buy from an art shop when possible rather than online because it would be a great shame to lose our art shops. I've been buying from Webberley's since I was a child in the 1970's. Webberley's is a beautiful old building and apparently it's been an art shop since 1913! Today it looks much the same with the old dark wood fittings and staircases. The prices are still pretty competitive and it's great to browse and try for real. From experience my personal favourite is Faber Castell 9000 and find it the smoothest and most consistent pencil but I thought I'd give some of the others a try. 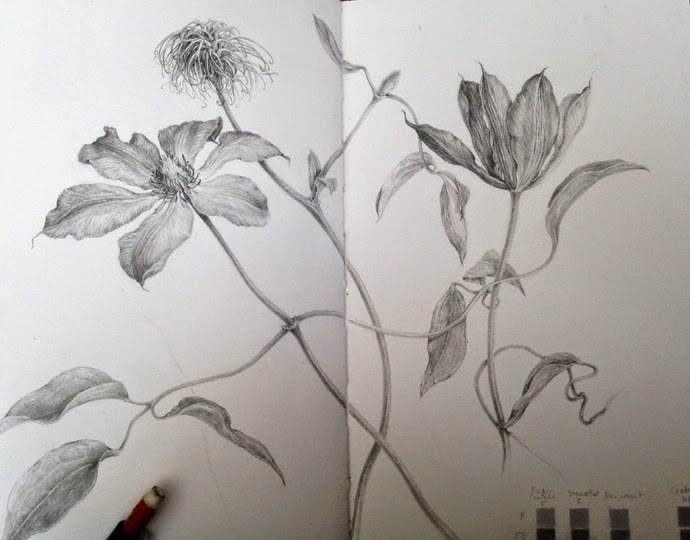 The subject I've chosen to draw is a Clematis, I don't know the cultivar name but it's one my mum bought from the RHS show I exhibited at in 2008. I'm working from a few cuttings with a fairly 'free form' arrangement which sprawls across the two pages of the sketchbook. I haven't really planned the composition but work with the natural shapes of the cuttings, which makes the layout fairly easy. A pencil is a stick of powdered graphite mixed with clay. Graphite is a mineral comprising almost pure carbon. In the mid to late 1500's a large graphite deposit was discovered in Cumbria, England and from its appearance was mistakenly thought to be a form of lead, which was named Plumbago, which is Latin for lead ore. Apparently locals used it to mark their sheep and wrapped string around the plumbago to use it as a primitive mark making tool. Further deposits were found in the US, Siberia and Asia but none so pure and soft as the Cumbrian find. The name ' lead' stayed with the pencil but pencils were never actually made of lead. However, the painted wood on old pencils did contain lead so it was possible to suffer from lead poisoning if you chewed your pencil! In 1795 Nicolas Jacques Conte discovered the process of mixing the soft graphite with clay and mixing with water slurry before firing. By adjusting the ratio of clay to graphite the pencils could be made harder ( lighter in tone) or softer ( darker in tone). Today pencils cover a range from 9H ( very hard) to 9B (very soft). The quality of the graphite can vary considerably though. Poor quality pencils are very scratchy and rough and the core breaks easily when sharpened. The outer wooden casing tends to be cedar. Long leads are definitely best! it saves constant sharpening of the wood and you can just fine tune on sandpaper. For a guide on how to sharpen see my last post. 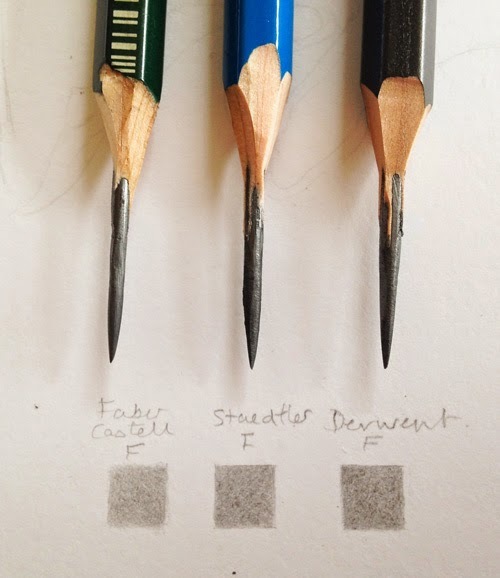 Faber Castell (left), Staedtler (middle) and Derwent (right). All 2H Faber Castell seemed slightly harder than the other two brands. Both Faber Castell and Staedtler sharpened well but Derwent was prone to breaking. The Faber Castell sharpens well as does the Steadlter, which has lovely soft wood which peels away beautifully with the scalpel. The Derwent seems to have a harder 'pink' wood which is more difficult to whittle away and it tears at times. Also with softer grades the Derwent breaks frequently compared to the other two pencils, but if you do suceed in sharpening without constant breaking and still have some pencil left ....... they sharpen to a pretty good tapered point. I found the Faber Castell to be a harder than the other two brands. The harder grades are therefore slightly lighter in tone. The difference is less noticeable in the softer grades for all brands. But given that I do most of my graphite work in grades between 2H and 2B this doesn't really matter so much. With this in mind I would say that the equal tonal value for a 2H Faber Castell could be achieved with Staedtler or Derwent using a 3H. The Staedtler felt very smooth on the sketchbook paper but I have found some pencils to be slightly scratchy in the harder grades and this was the case with Derwent, which was slightly 'scratchy' in application. All in all though a decent drawing could be completed with any of these pencils. The differences are minor, and a lot comes down to personal preference. I used different pencils on different parts of this drawing and it's impossible to tell and difference visually. I have heard students mention small marks in their graphite and while this can be a problem its often caused by small fragments of rubber rather than the pencil. I will probably stick with the faber Castells as they are still my preferred pencil, the Staedtler were also OK but I'll probably give the Derwent pencils a miss due to the problems with breaking and waste. 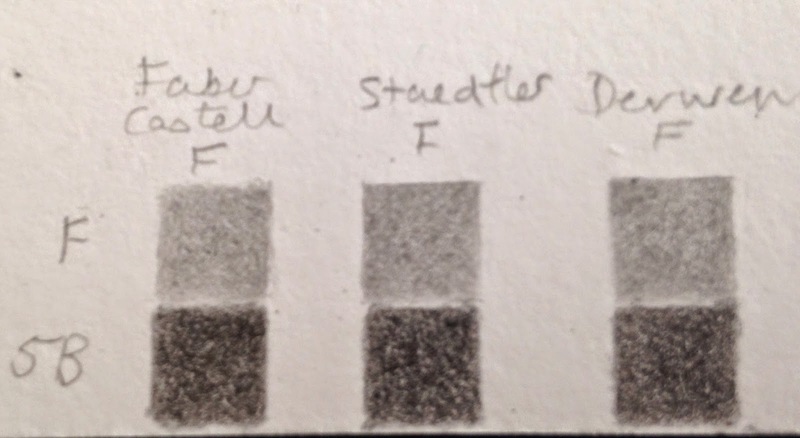 Comparison between Faber Castell 9000 and Staedtler Mars Lumograph. A slightly smoother ( less grainy ) finish is achieved with Faber Castells pencils. This test is on watercolour paper, particularly in the 2H to HB range. When teaching graphite I put students through fairly rigorous tonal exercises in order to help them to gain control of the pencil. Squares of graphite should not be darker at the edges but smooth and flat. This skill is vital particularly when working around areas such as leaf veins. When the control is poor it's obvious on leaves and quite often veins look outlined where they shouldn't be outlined. The correct amount of pressure must be mastered when using continuous tone, there is a maximum tonal value or 'darkness' of tone for each grade of pencil. There should be no need to add additional pressure to go darker and you should never make indentations in the paper or end up with 'shiny' areas. The weight of the pencil is kept predominantly in the arm /hand and not at the point where the pencil makes contact with the paper. If you find that the point where you start is darker it means that you are starting with a heavier pressure on initial contact - the pressure should be consistent. It's actually much the same as watercolour washes regarding a maximum tonal value. Usually there is no point in adding more than 3 or 4 washes of the same colour because there is a maximum tonal value to each colour after which it just gets thicker and flatter looking but not any darker in tone, to go darker you need to add a complementary colour or neutral tint.......... But that's another subject for a different blog post. With pencil If you want to go darker, don't apply more pressure but switch to a softer pencil grade of pencil. The line drawing is made lightly using a 0.3 mechanical 2H pencil. For the tonal work I used the Faber Castells and started with a 2H initially to add a layer of continuous tone all over, leaving only the brightest highlights clear, there should be no outline as such once the tone is added, thereafter form is created by using increasingly softer grades, paying careful attention to the light and shade between veins and folds ( 2H -2B and all grades in between). 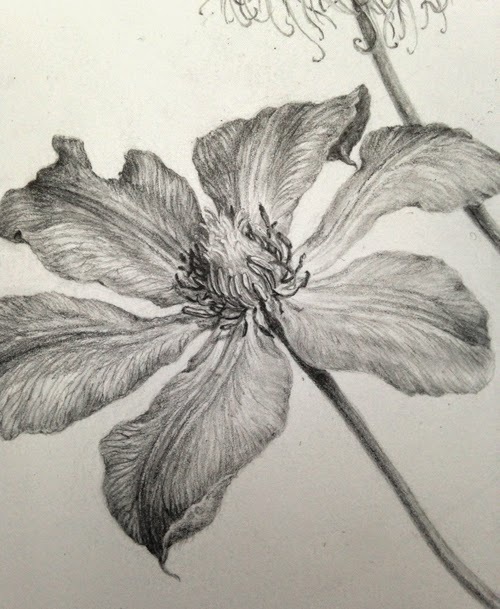 Detail is added on the darker ares such as the spent dark anthers using a softer 2B mechanical pencil. I used a combination of Cretacolour 3B on the dark soft areas, such as the leaf tips and also the 2B mechanical pencil to keep the edges tidy. All three brands were used in different areas of the drawing and it's not possible to see any real difference. The only difference is in using different grades to achieve the same tonal value in each brand. Thank you Shevaun, I love the Faber Castells too, when I compare them like this they are not that different but for me they just have the edge and the range within the grades is greater than with the other brands, also sharpening to long points - FC's hardly ever break, whereas the others do. Hi there. It's a beautiful drawing by the way. I must ask. Has been passed a couple of years, do you still prefer the 9000? This is uber informative! Thanks Dianne. A post I will constantly refer back to. 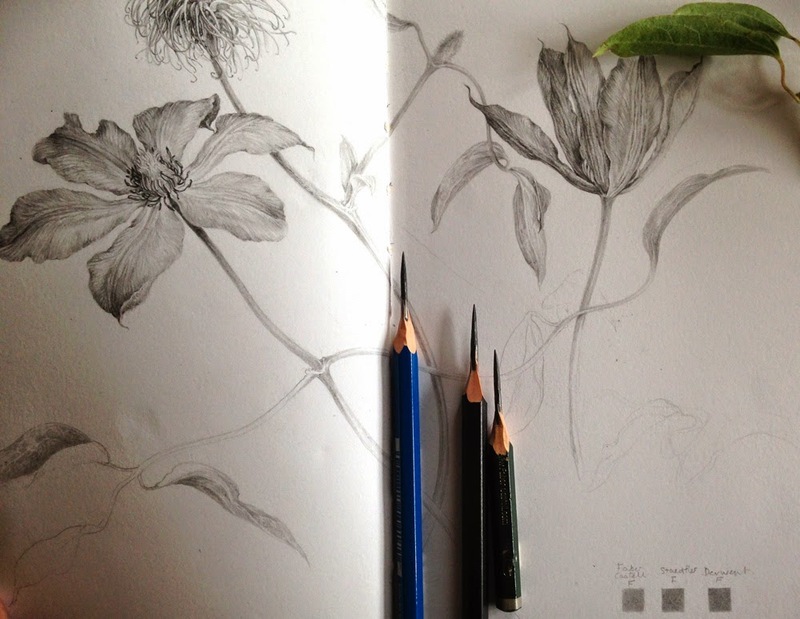 Thanks Jess, glad it's useful :) would be good to know what other botanical artists use too. I've done a bit of research on pencils and Staedtler Mars Lumograph seems to the Rolls Royce of pencils so far as most artists who work in graphite all the time are concerned. I do agree that the Faber Castell are slightly harder. They Staedtler certainly is very smooth and has a better feel Katherine but I prefer the harder slightly tighter finish I can get with the Faber Castells for tonal botanical work. I think for sketching the Staedtler is better though. I know quite a few other botanical artists who use the FC's so maybe it's a botanical thing? I'm still playing around with the pencils. Thank you for sharing. I have learn a lot. Interesting post, and the clematis drawing is fantastic! The flower looks like it could start swaying in the breeze. I like Faber-Castell 9000's too. Lately, I've been trying out Caran d'Ache Grafwood pencils. I'd love to know what you think of them. I find them very smooth and the pencils themselves are light-weight yet thicker than most. Also each pencil is painted a shade of gray to match its hardness, so you can grab what you want at a glance--a great innovation! Best wishes! You've certainly got me thinking about the pencils I use Dianne. Great, informative post. You are am amazing artist. I have a question That's driving me crazy. Why do I need to use 4, 5, or 6 different grades of pencil to shade with when I can achieve the exact same results using 2 or at most 3 and pressure? I can just as easily get the full range using an HB, 2b, and a 4b. Maybe Im just not adept enough. Is it because to much pressure isn't good? It is more distracting to me to be constantly picking up and putting down different pencils. Granted a 9b is much darker than a b, I get that. But I can easily make a 2b look like a b, and a 4b look like an 8b. Wow!! !! Good Information and nice article. Lucky me I found your site by accidentally actually I was searching Buy mechanical pencils online but found better thing than that. Thank you for this posting. Just discovered your blog. I've contacted Cowley's but where might I find traditional vellum in the U.S.? Trying to avoid high shipping costs! All images and text on this blog are protected by copyright law and may not be reproduced in any form without the authors permission.